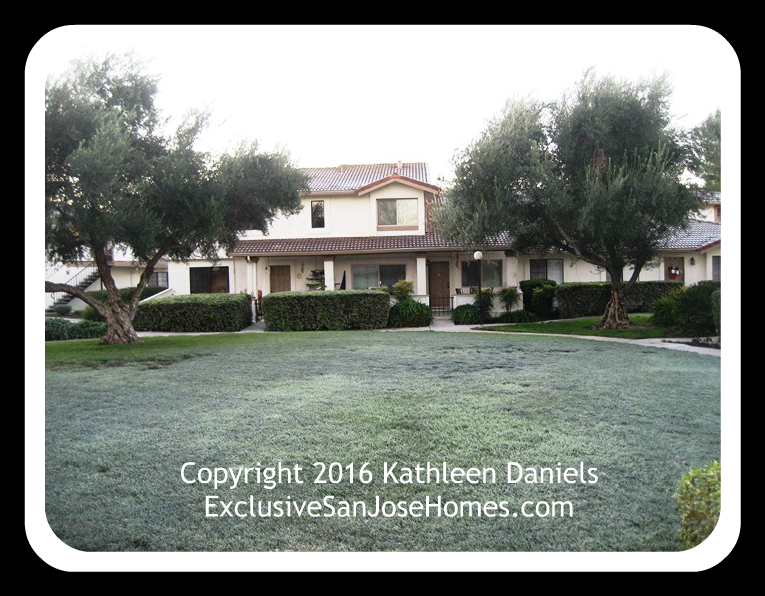 You are here: Home / Blossom Valley San Jose / What’s My Colony Green Condo Worth in January 2017? This is a Colony Green Condominiums market activity and home value report for January 2017. This report is comprised of statistical data extracted from January 1st through January 31, 2017 from our local Multiple Listing Service (“MLS”) as of February 1, 2017. The above photo was taken in the early morning on January 18, 2017. The near freezing temperatures is causing heavy frost on the lawns. Many Colony Green residents are covering their plants at night. Baby, it is indeed cold outside. Slow to zero sales activity in the first quarter of the year is not uncommon for the community. The December 2016 report may be viewed here. You may find the 10 year review report interesting as well. There was 1 reported closed sale in the Colony Green Community in January 2017. The community is located in Blossom Valley in San Jose, CA. The community is across the street from Martial Cottle Park on the Chynoweth side of the park. “B Unit” Sold: This is a downstairs 2 bedrooms, 1 bathroom, 942 square foot condo. Listed on October 27, 2016 for $509,900. It went status pending on November 4, 2016. The sale closed on January 13, 2017. Reported sales price is $480,000. Total days on market was 8 days. Buyer made the purchase with conventional financing. This property was a bank-owned home. I would have bet money that the condo would not have sold for the list price – not even in a hot sellers market or in this highly desirable Blossom Valley community. Let’s chat. I’ll explain my documented approach to listing a home for sale and what I will do get your condo sold quickly and net you more money from the sale. If you would like more detailed information about the Colony Green Condo community in Blossom Valley contact me at 408.972.1822. No one knows the Colony Green Condo Community better than me, Kathleen Daniels. That’s right. I am an original owner and I live here. PREVIOUS« What’s My Campbell CA Home Worth in January 2017?